As the reader will see from the following newspaper articles concerning his death, Polk Wells was a classic Wild West badman. He rubbed shoulders with the likes of Jesse James, Kit Carson, and Wild Bill Hickock. He was intelligent and well-spoken, writing his autobiography in the Penitentiary at Fort Madison where he served a life sentence for killing a 73-year old guard during an escape from that facility. The book, "The Life And Adventures Of Polk Wells", was reprinted as recently as 1971, and is both entertaining and self-serving, as Wells takes great pains to portray himself more as a well-meaning Robin Hood than the violent criminal he was. Wells served the vast majority of his sentence at Fort Madison. After contracting tuberculosis ("consumption"), he was transferred to Anamosa, where better prison hospital facilities existed. Wells hung on for only sixteen days before passing away on September 11, 1896. 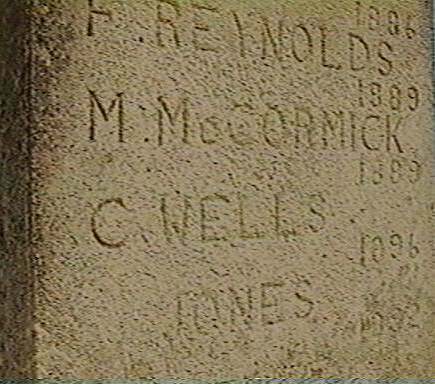 Although the picture below clearly shows a marker in the prison cemetery with his name on it, Polk Wells is not buried there. After his death, his body was immediately escorted back to his home area of St. Joseph, Missouri, where it was given to a medical college for dissection. The best explanation for the erroneous gravestone is also the simplest: a clerical error at the time of his death. On August 26, there was brought to the Penitentiary at Anamosa from the Fort Madison prison a man around whom lingers only the tale of a depraved life and the memory of years of crime and outlawry. This man was Charles Knox Polk Wells, whose career was ended last Friday by the life sapping enemy of humanity, consumption. Early in life Polk Wells chose for his companions the James and Younger brothers, thereby choosing also a life which was sure to be checkered with crimes of nearly every nature. Wells went under the alias of C.H. Warner for some time, but oft times when some crime was proved against him and his correct name leaked out, his name became common and familiar with officers and detectives, particularly with that greatest of detectives, William Pinkerton. For many years, Wells has been a train-robber and all-around bandit in Missouri, Kansas, and Iowa. Riverton, Iowa and Winston, Iowa were victims of his rapatious instincts and many daring pieces of outlawry under his leadership were effected in Halls City, Missouri and other points in the latter state. Sheriff Dan Farrell of Mills County, Iowa and Sheriff Chandler of an adjoining county finally started in pursuit of this terror of the woods, and after many weeks of searching and clue following, traced Wells and an associate desperado to Randolph, Wisconsin, where a furious fight occured between the officers and the bandits in a crime-painted saloon, where the officers were badly punished. Wells was a very muscular man, tipping the beam at 200 pounds and was built from the ground up, always ready to square himself for a fisticuff, catch-as-catch-can or a little time with revolvers. To attempt his capture meant great risk and the officers who should undertake to get the handcuffs on him knew that the attempt was fraught with danger to the finish and probably death. The only way to capture him was by cunning and superior force. In the above mentioned fight Farrell was shot four times. Norris, Wells' partner three times, and Wells himself so badly injured and maimed that he was taken from the saloon to the train and from there to Chicago on a stretcher. Though he seemed to be injured beyond every hope of reviving strength and though he appeared helpless, the officers having him in charge were in such fear of him that a strong and watchful guard was kept constantly over him. Hundreds of people who had heard of the notorious bandit flocked to the central station to catch a glimpse of him. He and his partner were finally lodged in the Fort Madison Penitentiary. While serving his sentence there he chloroformed a guard and made his escape (ed. - the guard later died and Wells received a life sentence for the murder). In effecting his capture several of the pursuing officers were wounded. From Fort Madison he was transferred here August 26 on account of the better hospital and better care. Here he died last Friday at 8 o'clock, of consumption. Emaciated and his spirit broken, his once powerful frame had dwindled into nothing more than a shadow. Wells married Nora Wilson at his home in Missouri in 1872 and there started a grocery store and saloon, but failed in this mercantile adventure and again took to his wild career. After two years of bandit life he went back to his home intending to settle down and quit the road of crime he had been traveling, but finding his wife had remarried and that his child was dead, he forsook forever every other ambition and consigned himself to the life he had hitherto been leading and which had landed him in the state prison. Since he has been in prison he made a profession of Christianity and claimed that he had been forgiven of his sins. Last January he endeavored to get a pardon on account of failing health but was unsuccessful. For the last three months his condition kept changing for the worse and ever since his arrival here, death was looked for at any moment. the remains were properly dressed and cared for and Saturday night were sent to his sister near St. Joseph, Missouri. Contrary to his early expressed wishes he did not die with his boots on. Charles Polk Wells was imprisoned originally for robbery. He was afterward sentenced to life imprisonment for complicity with two other convicts in the murder of a guard in escaping from Fort Madison. He was convicted in Lee County in 1882 and for the past six years has made biennial attempts to secure a pardon from the state legislature. In the meantime he professed to have been converted and to have become a Christian. He asked a pardon from the last legislature on the grounds that he was dying of consumption, proven by his death to have been correct, that the guard who was killed was killed accidentally by Wells' companions and not by him and that the other parties to the murder had already been let out. His plea fell on deaf ears. 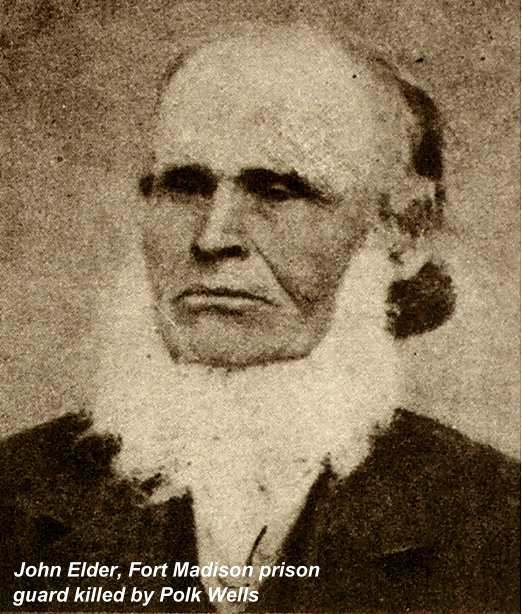 JW Elder, employed at the Clarinda asylum, is a son of the guard who was killed by Wells and his companions when they escaped from Fort Madison May 1, 1882. He denies that Wells' story is correct. He was a resident of Fort Madison at the time and was in the hospital ward of the penitentiary with his father at the time of the murder. He says Wells directed the movements, that he superintended the administration of the chloroform, and that the guard was not intoxicated, as claimed by Wells. A daughter of the guard who was murdered lives at Dakota City, Nebraska, and is Mrs. F.H. Ayers. It was partially through the efforts of the son of the murdered man and largely by the protests of the law abiding people of the state the Wells was refused a pardon by the last legislature. Wells was born in Buchanan County, Missouri. After winning some money playing poker he bought a cowboy's outfit and started for the frontier. There he roamed the plains for ten years. He won fame as an Indian fighter from the Rio Pecos, in New Mexico, to the British domain, and from the Missouri to the Pacific slope. He was twice captured by the Indians and escaped. 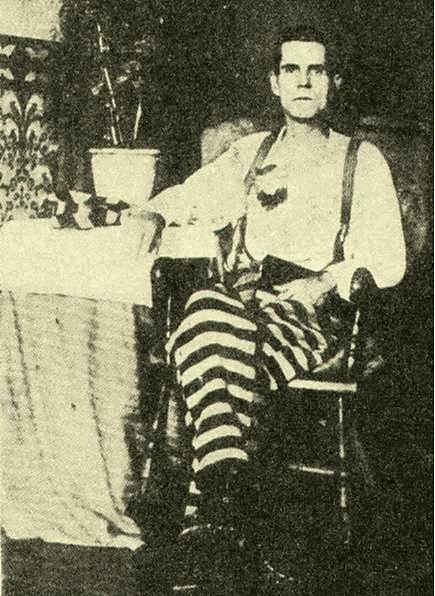 He made friends of Alf Slade, the stage robber; Billy Gay, the famous Montana cowboy; California Joe, the guide and hunter, and the renowned Kit Carson, who, after complimenting the marksmanship and praising the courage of Polk Wells, gave him a fine buckhorn-handled hunting knife, which afterwards served as an introducttion to the famous Wild Bill, with whom Wells went of several expeditiions against the Indians. In 1872 Polk Wells returned to Missouri, and married Miss Nora Wilson. He went into the grocery and liquor business, but through a technicality in the law he lost all his property, and leaving his wife and baby with her sister he returned to his wild life, promising to return soon in better fortune. But it was two years before he came back, and then he found his wife living with another man, Al Warnica, and the baby dead. In speaking of it afterward, Wells said, "Warnica was a hard-working young fellow, and I determined not to interfere, for there had been no intentional wrongdoing. I gave him $300 to buy a team with, kissed Nora goodbye, mounted my horse, and rode away." (ed. -- Warnica and Wells remained friends the remainder of Wells' life. Warnica published Wells' book posthumously). In May 1879, Wells said he committed his first crime, highway robbery. Then followed one express train and three bank robberies. With two companions he rode in the same coach with three Pinkerton men, who were looking for him and to whom he was pointed out by the conductor, but no attempt was made to arrest him, though they rode together from St. Joseph to Council Bluffs. The daring that he exhibited was at times so great that it was his best protector. "But my white brothers have used me pretty rough," he said. "I was hanged twice during the war by Kansas jayhawkers, was stabbed twice in the back by Mexicans, and from first to last have received into my body thirty-three bullets, twenty-seven of which still remain with me." (ed. -- after death the medical college had instructions to dig out the bullets and give them to Al Warnica). After his capture by Sheriff Farrell in Wisconsin, during which capture he was shot three times, Wells was taken to Sidney, Iowa, pleaded guilty, and was sentenced to ten years in the penitentiary for highway robbery. It was while serving this sentence that Wells and his two fellow convicts planened to escape, and in doing so killed the guard.